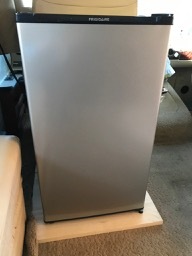 Well the New Year did not get off to a good start as our Norcold Refrigerator quit cooling and we were advised to disconnect as it might be a fire hazard. We have had problems with it since we bought the motorhome in 2009. 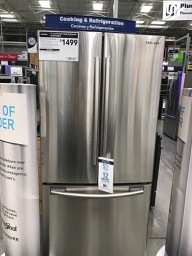 So off we went to Costco and Lowe's to purchase a small refrigerator for bare essentials and a residential Samsung for the motorhome. Several of our friends have had residential ones installed and like them. We scheduled an appointment with Johnny Walker RV for the install to take place 22 January. They will also install a new toilet. Hopefully all goes well and we will only have to spend one night there. To wile away the time we went to see UPSIDE with Joy and Kevin at the Cannery and breakfast before movie. Highly recommend this movie based on a true story. We also went to Texas Roadhouse one night for dinner with them. First time we have been to one since we were in Texas one year. Very excellent service and good food. John said the chicken fried steak was best he has eaten. They open at 4 so be there at 330 to avoid long wait. They also give military discount. On way back we stopped at Krispy Kreme for donuts to give to gate personnel. They are so frest and delicious..we each got a free sample. 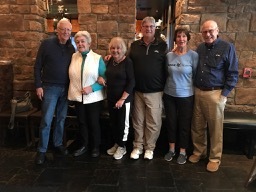 On the 16th our friends Don and Carolyn from Oregon were passing thru so we met them with Chuck & Rose Mary at PF Chang's for lunch. A nice place to go for visiting. Our lunch ended up lasting over 2 hours. 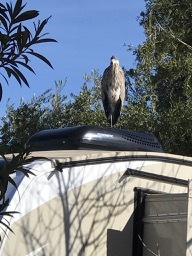 Yesterday, the 19th, on our way back from our walk our neighbor pointed out a blue heron on top of Max and Caron's 5th wheel. 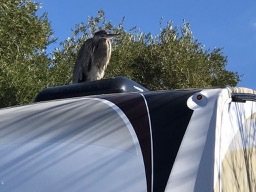 Couldn't believe it..in our visits since 2013 had never spotted a Heron in the campground. We all wondered from whence he came as there is no water around here. Anyway we he sat on top of the A/C for over an hour. Had quite a gathering to take photos and watch him. 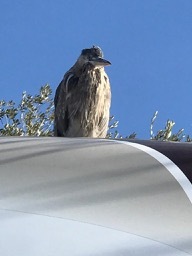 Finally when Max extended his awning, he flew away. Wish I had gotten the picture in flight, but not quick enough. We spent the night of 21 January at Johnny Walker's RV to be there early for the install on the 22nd. They have full hookups, but we only needed the electric..50amp. Spent the day of the install doing some errands. Finally down to the wire at 500PM, the install was complete and we headed back to campground with me following John thru the horrible LV traffic and crazy drivers. Must say Johnny Walker did a great job installing the fridge and toiler. They had to take the old Norcold and bring in the new Samsung through the passenger window. So happy they did not have to take the front window out as that would have been an additional expense and wait. 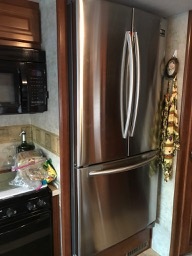 Have never had a refrigerator this roomy and no more defrosting and air leakage.In my opinion all RV's should have residential refrigerators. 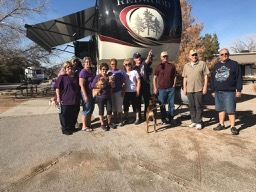 On the 23rd Joy and Kevin invited us to see A Dog's Way Home. Another movie I highly recommend. A very sweet story about Bella. Ron Howard's daughter Bryce is the voice of Bella. The dog featured in the movie was found in a shelter and the trainer adopted her. We then went to dinner. They treated us to the movie as a thank you for walking Shylo when they are gone. Actually the pleasure is all mine. She is my motivation and such a precious and sweet dog. Will miss our walks when we leave. On the 25th around 10 of us are driving to Mesquite to view the Balloon fest. We will overnight. Should be lots of fun.